We move on to video recording and the first part of the test is naturally performance in good lighting conditions. We took our three competitors out and shot our traditional video recording test from the same place and at the same time of day. These 30 second clips are taken with minimal time in between, so as to minimize any external factors which may affect their performance differently. Let's take a look at each device in detail. 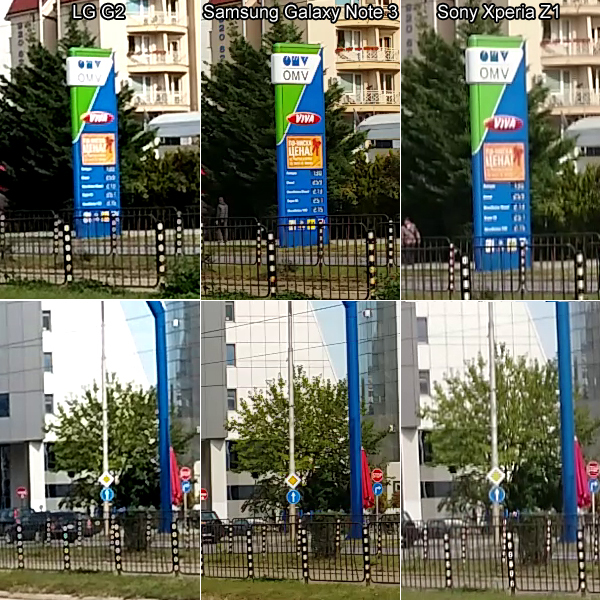 Under normal lighting conditions, the Samsung Galaxy Note 3 has the best camcorder on a smartphone we've ever seen. The colors are spot on, the level of detail is unparalleled, and the exposure and contrast are nailed perfectly. It even has the best dynamic range of the bunch. The Note 3 also shoots in 4K, although at the expense of dual-shot mode, still image shooting while recording, and image stabilization. We took a side-by-side look at how its 4K video stacks up to 1080p, and found that the higher recording resolution really pays off when it comes to the amount of resolved detail. Below, we've rendered it alongside the 1080p video so you can get an idea of how it stacks up. For all its great recording extras (the Tracking Zoom feature is very cool), LG seemed to have lost sight of the basics required to make a decent video recording experience. The G2's exposure is so far off that it absolutely ruins the clips, and the constant refocusing quickly goes from distracting to infuriating. The colors are more or less accurate but the exposure affects them as well. The Sony Xperia Z1 has great potential, but ultimately ends up being doomed because of its poor contrast. If you can get past that, you'll see that the colors are accurate, the exposure is correct, and the dynamic range is rather good. There are a few issues with an overly-enthusiastic autofocus, but it's not nearly as bad as what you'll find on the G2. Finally, we prepared a crop so you can see just how much detail the FullHD videos from all three competitors have. Winner: Samsung Galaxy Note 3. 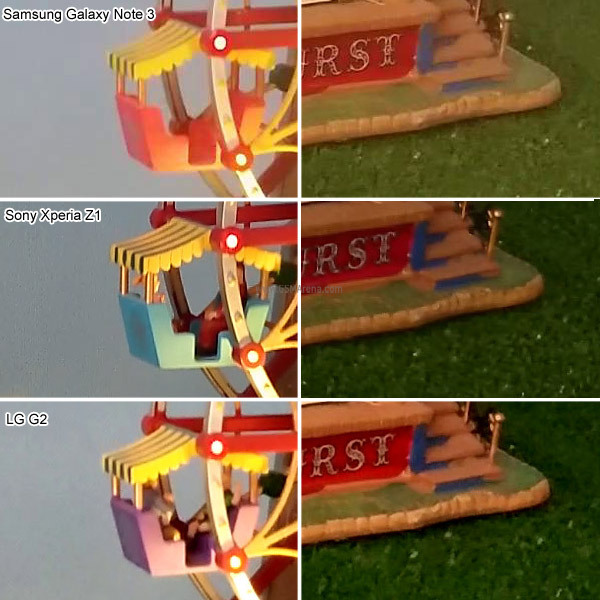 Even when the playing field is even and we are comparing 1080p footage the Galaxy Note 3 has a clear advantage over its competitors. And when it kicks into higher, 4K, gear the other two stand no chance. Runner-up: Sony Xperia Z1. The Sony Xperia Z1 produces decent footage with good detail levels and no major weak points to it. Third place: LG G2. The LG smartphone has an overly-enthusiastic autofocus that hunts too much and ruins the clips. The exposure is also off more often than not, so the G2 is in desperate need of some fine tuning through a firmware update. While things may be fine and dandy when it comes to shooting in well-lit conditions, under low light things can change drastically. Let's take a look at how things stand when the lighting is not ideal. In a very drastic twist, the Samsung Galaxy Note 3 came in dead last due to its inability to find the proper exposure and contrast under low lighting. Even its 2160p 4K resolution was not enough to salvage the lost detail. The Sony Xperia Z1 also has traces of detail in the background, but the noise reduction has smeared most of it. The LG G2 is once again an exposure nightmare, with some badly overblown colors to boot. We lose most of the detail thanks to the camera's inability to properly expose the image under low light. The Sony Xperia Z1 has the best colors, better contrast and highest amount of detail with the lowest noise among the three. Winner: Sony Xperia Z1. The Sony smartphone really excelled in this test, resolving the most detail and not suffering the exposure issues of its peers. 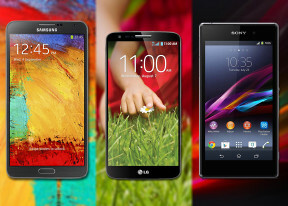 Runner-up: LG G2. A rather distant second, the LG G2 at least got the contrast right. Third place: Samsung Galaxy Note 3. The Samsung phablet failed miserably producing videos with poor contrast and very little detail.